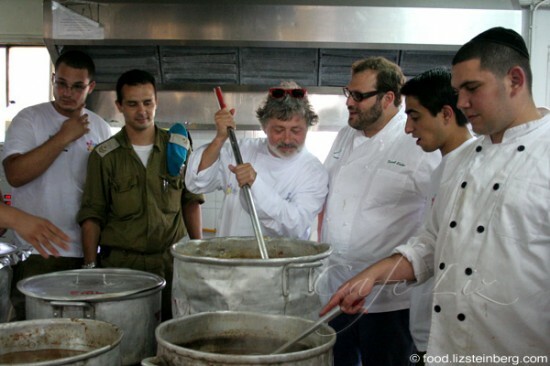 I had the pleasure of joining New Orleans chefs John Besh, Alon Shaya, Jacques Leonardi and David Slater on a base in the Golan Heights last week as they prepared dinner for a battalion, as part of a Jewish Agency program between New Orleans and Rosh Ha’ayin. So what happens when you dump four top chefs into a military kitchen and force them to work with the limited tools at the army chefs’ disposal? 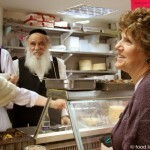 You can read articles I wrote about it at Haaretz and the Israel Food Tours blog. I’d never seen so much food being prepared, but they were completely unfazed by the immensity of the task. Also worth checking out is my discussion with Alon about what makes Israeli cuisine. Unlike many of this country’s chefs, Alon does indeed believe that there is such a thing as Israeli food, and explains why. I couldn’t have put it better myself. 5 Responses to "What does it take to cook for an army?" awesome article liz. when can we expect to see a Cafe Liz cookbook? I like the fact that there are chefs who can forget for a while every monetary aspect and prepare good food to make people happy. So true! I think that was entirely their goal.